I thought this might help some with their smoke reports...the majority of this was a 'copy and paste' from another forum. Thank you 'Zeppelindood' , this information is invaluable to me right now. AFTERTASTE - Term used to describe the taste left in the mouth after exhaling the herb. Both character and length of the aftertaste are part of the total evaluation. May be harsh, hot, soft and lingering, short, smooth, tannic, or nonexistent. AMMONIA - Refers to the pungent odor and flavors which can be attractive in buds. Can also have negative connotations depending on context (eg: moldy herb, from damp buds etc). APPLEY - Refers to smell or aroma of a herb, usually carrying additional modifiers. "Ripe apples" describes a full, fruity, clean smell. "Fresh apples" does the same for some types. "Green apple", however, is almost always reserved for Sour strains. AROMA - The intensity and character of the aroma can be assessed with nearly any descriptive adjective. (eg: from "appley" to "raisiny", "fresh" to "tired", etc.). Usually refers to the particular smell of the variety. The word "bouquet" is usually restricted to describing the aroma of a cured herb. ASTRINGENT - Descriptive of herbs that have a rough, puckery taste. ATTRACTIVE - The herb taster liked it anyway. A veiled criticism of expensive bud, a compliment for others. BACKBONE - Refers to big, full-bodied herbs with an evident kick or expansion to it. BERRYLIKE - Equates with the ripe, sweet, fruity quality of blackberries, blueberries, strawberries, raspberries, cranberries and cherries. The aroma and taste are often partly described with this adjective. BITTER - One of the four basic tastes. Some herbs have a distinct bitter edge to their flavor. Sweet herbs may have an enhanced bitter component that complements the other flavors making for a successful overall taste balance. BODY - The effect on the taster's palate. Often described as "full", "meaty" or "weighty". BODY ODOR - Describes aroma and flavor reminiscent of human body odor. A salty smell. BOUQUET - Near synonym for "aroma". Term generally restricted to description of odors from cured buds. BUTTERY - Describes taste sensation found in some herbs. CANDY - Refers to the perfumed fresh fruit aromas and flavors which can be attractive in buds. Many consider it a desirable characteristic in longer-cured herbs. CEDAR - The taste or aroma of freshly sawn ceder wood. CITRUSY - Describes aroma and flavor reminiscent of citrus fruits. COMPLEX - Almost a synonym for "breed". Possesses that elusive quality where many layers of flavor separate a great bud from a very good one. Balance combines all flavor and taste components in almost miraculous harmony. CREAMY - Refers to "silk-like" taste component of herbs as opposed to the "tart/crisp" taste component. Almost a synonym for "buttery". Opposite of "crisp". DEPTH, DEEP - Refers to a premium bud that demands more attention, it fills the mouth with a developing flavor, there are subtle layers of flavor that go "deep." DIESELY - Aroma constituent reminiscent of diesel/petrol/gasoline engine fumes. DIRTY - Describes any of the undesirable odors that can be present. A characteristic imparted various processes performed incorrectly. EARTHY - Covers situations where a "mother-earth" component is present. Earth is soil-dirt, but an earthy bud is not dirty as in "DIRTY" above. The term appears to be applicable to herb thought, by some, to be fed from certain soils obtained from land previously used for growing vegetables containing components which "marked" the soil in some way. EASY - Undemanding but pleasant, doesn't require good taste, just tastes good. ELEGANT - What to say when there is great balance and grace in the bud, but you can't quite find apt words of description. EXPANSION - A good way to measure the fullness, body and content of herb. High expansion generally accompanies high quality bud. FAT - Fills the mouth in a positive manner. The bud "feels" and tastes a little obvious and often lacks elegance but is prized by connoisseurs of sweet herbs. FINISH - As in "this herb has a (whatever) finish to it". FLAT - Opposite of "full-bodied". Usually indicates very low expansion and lacking flavor. FLINTY - Synonym for "stoney". Derived from French phrase "gout de pierre a fusil", literally a smoky, whiff of gunflint, almost acrid taste. These terms are presumably metaphorical approximations based on the flavor sensations allegedly present in herbs. FLORAL/FLOWERY - Suggests the aroma or taste, usually aroma, of flowers in herb. "Floral" usually employed as an adjective without modifier to describe attributes of herbal aromas. FOXY - Common descriptive word used to note the presence of a unique musky or grapey character. FRUITY - A fruity bud has an "appley", "berrylike" or herbaceous character. "Fruitiness" usually incorporates the detection of a little extra sweetness as is found in really fresh grapes or berries. FULL-BODIED - As opposed to "thin" or "thin-bodied". Fills the mouth, the herb has "weight on the tongue". FUNKY - Defies precise definition. Appears to be a 1970's cannabis culture derived word sometimes used by North American west coast growers and reviewers when describing vegetal/yeasty/yeastlike aromas so complex that individual identification is difficult. Can have positive or negative connotations depending on context. GAMEY/GAMELIKE - Descriptive term for one of the flavors/aromas considered very particular. Reminiscent of taste and flavor associated with cooked wild duck and other "gamey" meats. Considered a major flaw when flavor is overly-pronounced. GNARLY - Perceived as rough-edged, very harsh. Applies to uncured herb. GRAPEFRUITY - Grapefruit flavours are characteristic of many cool-climate herbs. GRAPEY - Content has simple flavors and aromas reminiscent of a certain type of table grape. Used by some as adjective alternate for "foxy". GRASSY - Slightly vegetal-tasting undertone often part of the overall character uncured bud. European tasters sometimes use the word "gooseberry" to describe this flavor. In minute presence it can enhance flavors. As it becomes more dominant the more it loses appeal leading to unattractiveness. GREEN - Strictly applied refers to the taste of herbs undergrown and undercured. More loosely used it refers to some bud possessing the greenish color tint indicating youth. HARD - A sensation of dryness in the mouth, a degree of puckerness. HARSH - Very astringent herb, often have this rough, rustic taste characteristic. May become more tolerable with aging but also may not be worth the wait. HASHY - Adjective used in description of herb with taste and aroma of hash. HAZY - Used to describe the effect of the herb's high. If the haziness is intense enough to cause loss of clarity it may indicate extreme potency. HEARTY - Most often applied in the description of full quantity and warm qualitity. Also applies a sturdy plant. HERBACEOUS - Adjective used in description of herb with taste and aroma of herbs, (usually undefined). JAMMY - Refers to the natural berrylike taste of this grape. LAVENDER - The taste or aroma of freshly ground lavender. LEAFY - Somewhat analogous to "vegetal". Desirable in minute detectable amounts, if adding to notes of complexity in the bubblehash. Also refers to leaf to calix ratio. LEAN - More body would be good, sort of thin in the mouth, sometimes a compliment for certain styles. LEMONY - These buds contain flavors reminiscent of that fruit. Apart from that, may be well balanced in all other respects, sometimes with a touch of extra sweetness. LENGTH - How long the total flavor lasts in the back of the throat following exhale. LINGERING - Term used to describe the taste left in the mouth after exhaling the herb. Both character and length of the aftertaste are part of the total evaluation. May be harsh, hot, soft and lingering, short, smooth, tannic, or nonexistent. How long the total flavor lasts in the back of the throat following exhale. LUSH - Describes impression of herbs with high amounts of residual tHc. Adjective almost entirely reserved for sweet bud. MEATY - With much body as though you could chew it. The reference is to lean meat, so indicates less body present than "fleshy". MUSTY - A bud that displays unpleasant "mildew" or "moldy" aromas. Results from improperly cleaned storage vessels, moldy grapes or cork. NUTTY - Buds that have been exposed to air after cure display this aroma which resembles that of certain nuts. Considered a flaw by some, but a desired flavor component in certain herbs by others. OAKY - The taste or aroma of freshly sawn oak. A bud is considered as correctly "oaked" when the "nose" carries a bare whiff of vanilla aroma. Sometimes oak flavors overpower other component herb flavors in which case it is considered overoaked. The "oaky" components encountered include so-called "toasty", "charred" or "roasted" elements. OILY - Describes the vaguely fat, slippery sensation on the palate after exhale. PEPPERY - Term almost solely applied to "spicy" herbs. Is a component which can almost be described as pungent in quality, being reminiscent of anise, cinnamon etc. PERFUMED - Synonym for "floral". Implies also a degree of extra residual sugar. PETROL - Aroma constituent reminiscent of diesel/petrol/gasoline engine fumes. PINE - The taste or aroma of fresh pine needles and cones. PLUMP - Less than "fat", but otherwise nearly a synonym. POWERFUL - Close to being a synonym for brawny. PUCKERY - A sensation of dryness in the mouth, a degree of puckerness. Very sour tasting. PUNGENT - A very strong smell or powerfully sharp or bitter taste. QPR - Acronym used by Mail-list users as shorthand for "Quality-Price-Ratio". Generally refers to a herb considered good value for the price asked. RANCIO - Word normally used to describe a flavor perception. Refers to the peculiarly blowsy overly-ripe fruit aroma, analogous to overipe bananas. REFINED - Term for well-balanced herbs. Mostly refers to " owerful" strains. Almost a synonym for "elegant". RICH - Giving a full, rounded flavor impression without necessarily being sweet. Richness supplied by tHc. The sweeter buds qualify for this adjective if also characterized by ripe, fruity flavors. RIPE - Favorable adjective bestowed when the characteristics of the bud are optimally present in a well balanced bud. They tend toward being slightly more fruity and sweet. Cured a favorable amount of time. ROBUST - Vigorous, full with a lot of heart, a big scaled bud. Solid expansion. ROUGH - Flavor/texture is coarse. Harsh and unpleasant. RUSTIC - Synonym for "rough". SANDLEWOOD - The taste or aroma of freshly sawn sandlewood. SHARP - Excess, disturbing the otherwise balanced flavors. SKUNKY - These buds contain flavors reminiscent of a foul odor ejected from a skunk. Apart from that, may be well balanced in all other respects, sometimes with a touch of sourness. SOFT - Generally describes herbs with low tHc content. Consequently has little impact on the palate. SOUR - Is one of the four basic taste sensations detected by the human tongue and found in bud. Tangy. SPICY - Almost a synonym for " eppery". Implies a softer, more rounded flavor however. STRUCTURE - Term for overall flavor. Used to suggest complete impression of the herb. Needs a modifier in order to mean something (eg: "brawny" etc). STURDY - Most often applied in the description of full quantity and warm qualitity. Also applies a sturdy plant. SWEET - Refers to one of the four basic tastes detected by the sensory nerves of the human tongue. In the description of the buds taste-flavor the term "sweet" is almost always used as an identifier denoting the presence of residual sugar. Herb aromas require a descriptive term to identify the source of the perceived sensation (eg: "ripe", "lush"). TART - Synonym for "acidic". TASTE - Refers to the basic sensations detectable by the human tongue. Current scientific opinion defines these as "sweet", "salty", "sour", "bitter". THIN/THIN-BODIED - Opposite of "full-bodied". TOASTY - Other, similar descriptors are "caramel" and "toffee". Some also add spicy flavours, such as "cinnamon" or "cloves". UNDERIPE - Resulting flavor when herb that failed to reach optimum maturity. VANILLA - Component detectable in the "nose" of a bud. The novice taster can compare odors with the vials of artificial ones. VEGETAL - Considered a flavor flaw when present in distinctive amounts over and above that occurring naturally in the bud. "Grassy" has somewhat the same connotation. VOLATILE - Powerful, attack aroma. Usually denotes high level of flavor faults. WEIGHTY - Well-structured/balanced herbs with an implication of mildly excessive flavor or "heaviness". WELL-BALANCED - Contains all of the essential elements - (ie: tHc, flavors, astringency etc) - in good proportions. 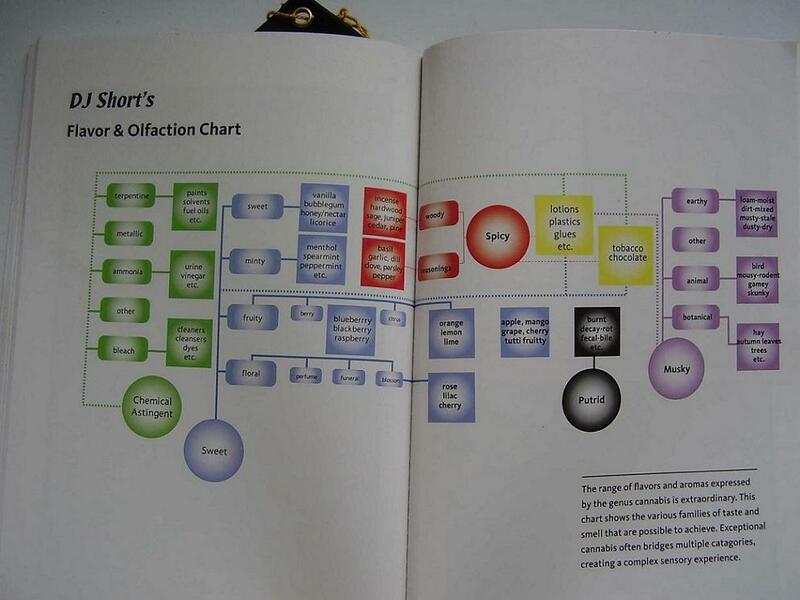 And, finally...a chart from DJ Short's book attached as picture below. Though not exactly a "strain" related article, much information concerning flavor. Which is, to some, a factor in strain selection. a cut and paste from cannabisculture's library that I recently 're-discovered' in my notes.hopefully noone takes offence to me sharing the knowledge but tis good informations that should be shared . by DJ Short (01 Sept, 1999) An educated and descerning palate is a key requirement in breeding and appreciating cannabis. Olfaction is the term used to describe the sense of smell. The olfactory bulb is the main sensor used to experience and interpret smells. This organ is located behind the nasal passages – up your nose. The sense of smell is one of the most complex we possess, and more of the brain is dedicated to processing smells than any other sense. Smell is closely related to memory, especially older memories. Anatomically, this region is located between the cortex and the occipital lobes, above and around the ears to the top of the head. There are many similarities between the wine industry and the cannabis industry. One of these is that both use "expert palates" to identify and discern the various desirable traits of a product. However, unlike wine, cannabis has another added aspect to consider: the type of experience produced by the product. Alcohol's main experience is similar (and overconsumption can be fatal) while cannabis provides a wide range of effects and is non-toxic. The first spectrum to consider is the "up and down" experience. "Up" refers to the stimulating aspects of cannabis, while "down" refers to sedative qualities. Up pot tends to liven the disposition and stimulate the emotions, inspiring sociability and talkativeness. Down pot tends to produce sedative and depressant effects. Some people refer to stimulating pot as being a "head" high and sedative pot as being a "body" high, yet although partially true this is also misleading. Most of the cannabis I see on the market today has a terrible tolerance factor – a quick burnout time with the product's novelty lasting less than a week. Luther Burbank's model of breeding needs to be employed here and no expression of tolerance to your product is to be tolerated. An example of where intolerance to tolerance is tolerated – enough already! Another aspect of tolerance is "ceiling." This refers to how high (or far) one is capable of going with the variety. How many hits can you consume until more hits are unnoticeable? Most indicas have a low ceiling of less than 10 hits. For me that's usually around 5 hits in one smoking session. If I smoke more than 5 hits of a strong indica I will either not notice the post-ceiling hits, or I will fall asleep. Some sativas have a very high ceiling, or seem to have none at all! This means that the more you consume, the higher and further you go. Oaxaca Highland Gold, Black Magic African, and Highland Thai were some of the herbs I've tried with very high or no ceiling. The range of possible smells and tastes a human can experience is large and complex. To date, no-one has created a fully usable olfaction chart, but Ann Noble developed a nifty "aroma wheel" for the wine industry, which inspired me to develop a cannabis olfaction chart. Like Ann's wheel, more basic aroma categories like "fruity", "floral", "spicy" and " ungent" go in the centre, and branch out into more specific aromas. So beneath "fruity" goes "berry" and "citrus", and beneath "citrus" is "lemon", "lime" and "orange". The main cannabis aromas are: woody, spicy, fruity, earthen, pungent, chemical and vegetative – a wide range indeed. More specific aromas include pine and cedar under "woody", musty and dusty for "earthen", blueberry and mango under "fruity", and many others. Most aromas are possible through some combination of strains. Many of these strains were best expressed and acclimated when they were grown outdoors in their region-of-origin, or homeland. I strongly recommend the use of "tasters" to help analyze the qualities of a given smoke. I prefer highly educated, seasoned and critical elders as they tend to be the most helpful in their analysis and feedback. If there is the slightest drawback to the product, such as arrhythmia, tachycardia, paranoia, or what have you, the experienced elder taster will be the first to notice it. By the same token, if a product is exceptionally fine, the experienced elder taster will also likely be among the first to fully appreciate this. Besides, the elders always appreciate good medicine.